I’ve been a QWERTY typer since the days of Paws Run on an Apple II machine in elementary school. I can’t even find a reference to the game on the internet – but this would have been in the early nineties, when we wheeled the computer in each classroom to a big room once a week to make a computer lab. Maybe because my mother typed quickly, I was interested in picking it up. From then on out, it was a given – I could type quickly and relatively accurately. But then, just because something works, it doesn’t mean there isn’t a better way of doing it. QWERTY’s setup was rather arbitrary and not expected to be efficient. The only way to find out is to try it. When I joined Automattic, I found that using different keyboard layouts like Dvorak and Colemak are common and encouraged – as are most things that will help you be more efficient. Matt is a Dvorak typist. The idea is that if you spend so much of your day at your computer, you might as well be efficient at input. The idea seemed neat, so why not? QWERTY is the standard keyboard layout, with some small variations for different locations. It’s the layout designed in the 1880s with the aim to alternate hands to avoid jams – and anecdotally, to spell “typewriter” along the top row to aid in sales. 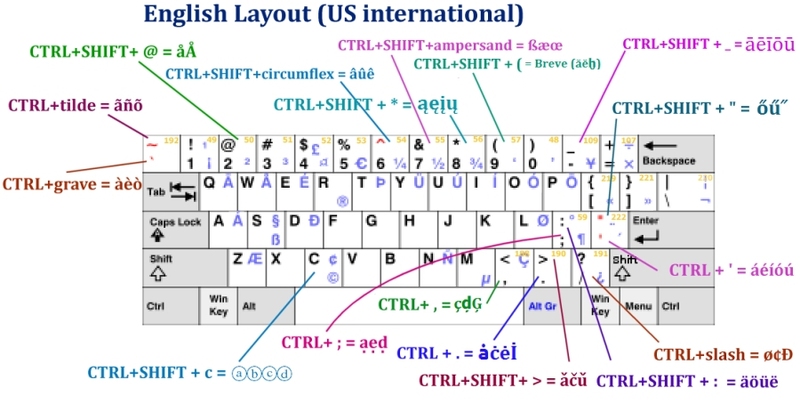 I’d learned the US 101 key layout in the US, then learned to use the 105 key US International layout when moving to the Netherlands. When I moved to Sweden, I got thrown for a loop with the three extra Swedish characters and the different placement of punctuation. I could type on it, until I needed to write anything code related. Eventually, I just made sure the US International layout was installed on my machines and I could type normally – as long as I didn’t look at the keyboard. The idea behind Dvorak and Colemak is that the layouts are more efficient: if you type the same string on all three layouts, your fingers must travel further on QWERTY. If you’re typing thousands of words a day, that adds up. Many QWERTY key combinations are also awkward and difficult to type. Colemak, on the other hand, is a relatively recent layout and was created by Shai Coleman. The goal was to make easy writing letters placed most frequently under the strongest fingers. This is to prevent RSI syndrome that can be caused by repetitive and lasting movements such as pressing keys frequently in an unfavorable position, so a faster typing speed is achieved. One of the reasons people choose Colemak is because it changes far fewer keys – it also keeps many of the standard shortcut keys such as C, V and X in the same place. I chose Colemak because I liked the idea of something more modern and generated with support from computers. It was fairly arbitrary, though. There are other derivatives of both keyboards available and it’s an easy rabbit hole to fall down. At one point, I was more fascinated with playing with the keyboard layouts than actually re-learning how to type! Learning a new keyboard layout taught me a lot about how my brain works and my personal learning style. I started with the first lessons at Typing Cat, which was a good introduction to the Colemak layout. I moved on to Keybr.com, thanks to a tip from a colleague. Keybr.com learns as you do, and gives you letters that you’re having trouble with. For me, it didn’t work – it became about how quickly I could hit the letters, which introduced mistakes, which just left me frustrated. I really had the best luck with Keyhero for practicing. It very clearly told me when I had messed up, had a great selection of texts and had statistics that showed my progress. This was where I spent most of my practice time. I really enjoy Typeracer because it has more interesting quotes and I like the competition. However, it will fail you out of the race if you can’t make it to 60 WPM. That meant I couldn’t play it until much later in the process. Also, it allows you to correct mistakes on the fly and doesn’t penalize you for them – except in total time. Once I hit about 40 WPM, I felt comfortable working – even though I was uncomfortably and frustratingly slow. I spent about a week going back and forth between QWERTY and Colemak, before I switched completely to Colemak. Switching meant that I needed to unlearn all of the deeply embedded QWERTY muscle memory from the last twenty-odd years. It felt like I was trying to break down a wall. Any time my concentration wavered, my fingers automatically went to the QWERTY keys. Even now, more than a year later, QWERTY will occasionally happen. Because I essentially went cold turkey, I broke down the QWERTY muscle memory and then effectively lost it. If I look at a QWERTY keyboard, I need to hunt and peck – and there’s a lot of hunting. It’s painful. I think because the muscle memory was so strong, I had to break it down to learn something new – when I didn’t actively maintain it next to Colemak, it disappeared quickly. I think some of that has to do with how much of typing skill is muscle memory and not actual thought – my hands know exactly where the “L” is on the keyboard, but my head does not. One of the “selling points” for Colemak is that many of the shortcut keys such as C, V and X don’t change position while they do in Dvorak. In my experience, I had to relearn so much that having to relearn these as well wouldn’t have bothered me. I did play around with different Dvorak keyboards before truly committing to Colemak. Where Colemak had been difficult for me to learn because the QWERTY muscle memory kept interfering, Dvorak was easier. It seemed that because I’d already broken that deep muscle memory, it was easier to learn something new. Learning a new keyboard layout was humbling. In high school, I was typing something in the computer lab and someone commented, “I can’t even fake it that fast.” Going from 120 WPM on QWERTY and starting at 15 WPM in Colemak was sobering. Interestingly, I never made it beyond about 95% accuracy on Colemak. No matter how hard I focus, my mind jumbles the letters up – even now. I think it has to do with the way I think – all at once and in every single direction. I think in QWERTY, I was just fast enough that accuracy didn’t matter. I could correct my mistakes before they were even an issue. I also learned that any learning method that was boring or repetitive to me just didn’t work – I’d lose focus and get frustrated. Thinking back, this is true across most of my learning experiences. I learn best by getting a basic foundation, then jumping in. Fascinating that I had to learn a new keyboard layout before that became obvious! If you’re interested in the speed results of the switch, take a look at Results after 100 days of Colemak: 100 WPM. I wrote that post back in March 2016, after about three months on Colemak. I tested myself recently and I’m still between 80-100 WPM. I lose time due to not being so accurate. I’m satisfied with that – it’s fast enough to keep up with thinking when drafting emails or writing documents. My hands also do feel calmer on the keyboard – there is far less flailing about. I wish I’d taken a video of typing QWERTY and then typing Colemak, just to be able to compare. I still love caps lock as backspace, which I think makes me faster and more efficient. It was an absolutely fascinating experience! I used to take my QWERTY typing skills for granted – after all, I’d had them for most of my life and typing came as easily as breathing. Typing now isn’t difficult, but I value the skill much more. I’m still a bit curious about Dvorak and think that it would be easier for me to learn, given what I know. However, the consensus seems to be that Dvorak and Colemak are roughly even in terms of distance typed – there isn’t a strong reason to sit down and relearn to type again. However, I might, someday, just to satisfy my own curiosity. In that case, though, it might make more sense to re-learn QWERTY so that I have that skill available. I am lucky enough that I work from the same machine(s) all the time. If you’re constantly working on different machines or maintaining servers, switching the keyboard layout can get frustrating and difficult. I switched to Mac a few months after switching to Colemak. I found that Windows was much more flexible in terms of customized keyboard layouts. If you just want to type, though, the layouts included with Mac are fine. I had to build up a custom SVG layout, as there weren’t any Colemak templates, let alone one on the 105 key setup that I use. I consider Colemak to be a good extra layer of security. Especially on my laptop, which still has QWERTY keys! Nice custom keycaps on the Colemak board. Why don’t you Colemakize the keycaps on your laptop as well? They can usually be moved around fairly easily. And it’s fun to see the reaction when people try to type on it. I’ve got a Scandinavian layout which has different combinations of some punctuation – it’s easier just to leave the stickers on the few keys as needed. My keyboarding journey brought me back to QWERTY for the simple reason of being universally proficient. However I am tempted to switch from time to time. Especially since I have not been able to break the 40WPM mark on my typing speed. Previous Previous post: Did she fake those Fitbit steps?